Protest against Citizenship Bill. File Image. 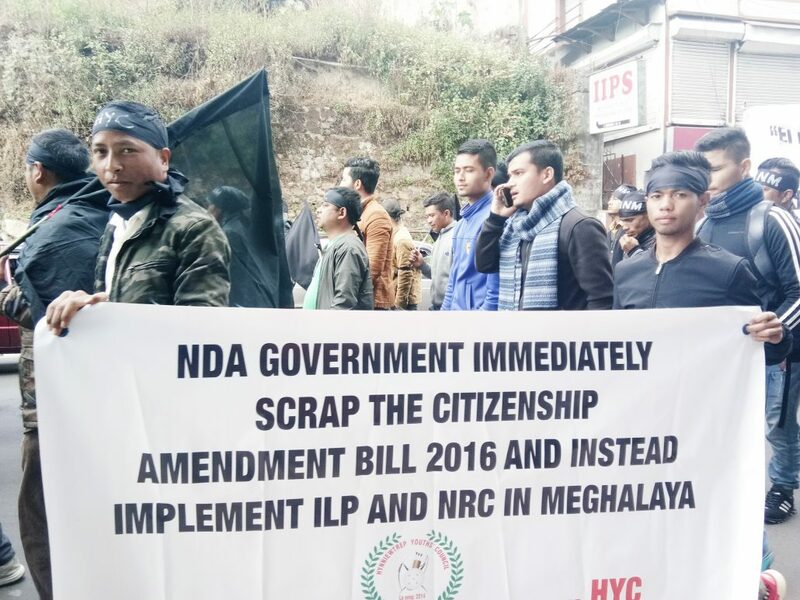 As many as 14 groups demanded implementation of Inner Line Permit (ILP) and National Register of Citizens (NRC) in Meghalaya as they staged a black flag march in protest against the Citizenship (Amendment) Bill, 2016. The protestors came together under the banner of the Confederation of Hynñiewtrep Social Organisation (COHSO) to protest the Bill aimed at amending the Citizenship Act, 1955 to make illegal migrants who belong to Hindus, Sikhs, Buddhists, Jains, Parsis and Christians from Afghanistan, Bangladesh and Pakistan – eligible for citizenship of India. The activists who first paid tribute to former KSU leader, late Bull N. Lyngdoh at his bust near Shillong Law College, Malki here, marched upto the parking lot near Additional Secretariat as they carried placards, banners and black flags. The activists paid their tribute to late Lyngdoh on his 24thdeath anniversary. The 14 groups include HYC, JSU, JYF, HANM, AJSU, WJNC, EJNC, RBSU, CORP, MPUF, JSM, WKSU, WYF and HPF. The activists shouted slogans against the NDA government like “Modi government down down” and asked Bangladeshis to go back to their country. Hynñiewtrep Youth Council (HYC) president, Robertjune Kharjahrin said the Citizenship Amendment Bill, 2016 is a threat not only to the indigenous tribals in the North East, but a national security threat as well. “If Bangladeshis are more important than the NE people in the eyes of the NDA government and Prime Minister, Narendra Modi, he should become the Prime Minister of Bangladesh,” Kharjahrin said. The groups also lauded the Meghalaya Democratic Alliance (MDA) government for rejecting the Bill even as they demanded that an official resolution against the Bill should be also passed in the State Assembly as it was done by Mizoram.